the boys are back together again, and all is right with the world. as i type this, huck and his grandpa are curled up on huck's tiny toddler bed in huck's tiny toddler closet bedroom, my dad's legs sticking out of the doorway, having themselves a pirate powwow. this is the thing about my dad, is that my dad is my baby's soul mate mostly. 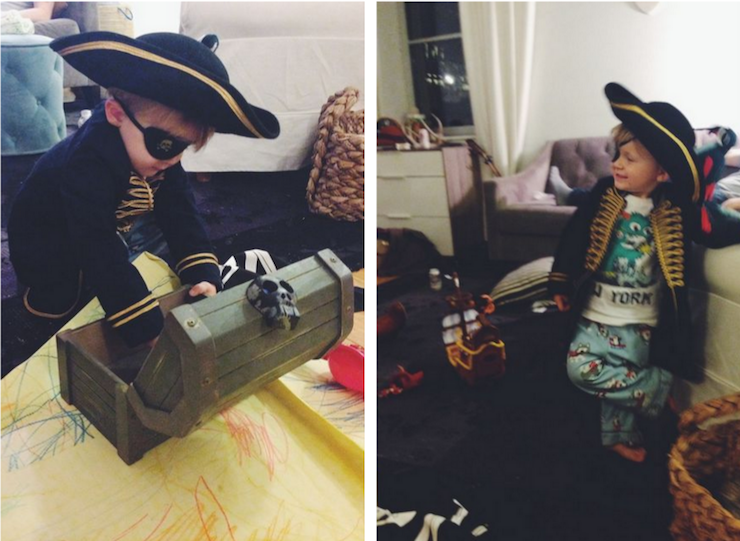 the other night my dad spread out our stash of crayons and got to making huck his very own treasure map to go along with the pirate treasure chest they'd brought from portland, to go along with huck's pirate costume that he still, most days, is almost always wearing. it was so exciting for me. i took about a million pictures of my dad drawing and teared up about a million times, because i am a ninny. the map came together pretty quickly, and then my dad took the time to carefully shade in the ocean and make sure those octopus limbs curled just right, and then i hung it up on the wall in huck's bedroom before huck could even have the chance to play with it because i am a killjoy. when i was a kid my dad used to tell us the story of the threeeeee dooooooogs. it was a multi-episodic tale of puppy mischief, there were voices involved, the whole thing. it was the iliad and the odyssey for us girls. (i wrote an essay in honor of it a few years ago.) one morning in church a long time ago my dad sketched me up a little picket fence with a red dog house out front, and then each one of the three dogs from the stories. and bless my little nine-year-old heart but i held that drawing carefully in my hands all through three hours of church, and put it away carefully in a folder when i got home, and it's moved along with me everywhere i've been since. i had it framed after i was married. it's on the save-in-a-fire list, that sort of thing. and i have to say, getting to share my dad with this kid has been one of my favorite parts of parenting. the two of us, we're the fan club. president and co-president. (we're also on the art preservationist team.) 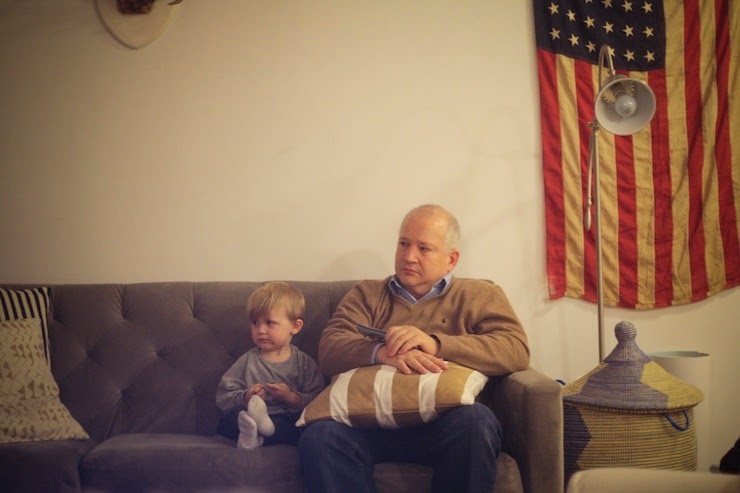 huck's got the best grandpa around, and my old man's not so bad, either. that first picture is the sweetest ever. those little crossed legs! i can't wait to see my dad with my kids some day. hope you all have fun together this week! Oh man, love it. Love all of it. Adorable! I Love, Love that first photo. What a cute little man! Both you and Huck are so lucky! The treasure map is killer! Dads are just so darn marvelous. What a sweet blessing! That map is amazing! Flat out amazing. That map! I want one. I love all of this. Thanks for sharing. This is so precious! My dad and my little guy are best friends as well. He loves to help his Papa in the vegetable garden. He says they are farmers. Sunday evening they went on an ice cream date. I teared up a little because I've gone on many dates with my dad and he is just a really special guy. I've prayed everyday since I found out I was having my son that he would be like my dad and I've been super blessed so far. "This is the thing about my dad, is that my dad is my baby's soul mate mostly." This made projectile tears come out of my eyes. I love your blog. It's my favorite. You write so beautifully and have such a great sense of humor. And you have a toddler son, as do I, so there's that. Not much better than seeing your own parents love on your child. Loved this! this is the sweetest. i look so forward to this part of motherhood—seeing my dad be grandfather to my babes. Finding out gender of 1st baby tomorrow and fingers crossed that I'll witness the the same thing with my parents as grandparents in upcoming years! Eek! ok that is so so sweet. Huck is a lucky little boy. Darlingest thing I've ever heard about, right here. How special! I love watching my parents love on their grandchild as well. I'm right there with you on swooping it up to preserve it in all its glory. What a precious memory! That treasure map! How perfect is your dad? Once I saw a man at Gold's Gym in American Fork, UT who I swore was your dad only I couldn't/wouldn't go ask him because how weird would that be? And also your dad lives in Portland so there's that. My hearts turned into weird little squares when I published. ??? So, the intent was LOVE, LOVE, LOVE this post! Lucky you and Huck!!! watching my boy with my dad is just about one of my favorite things, they have their own language and routine together. that first photo is. the. best. What a special Dad you have! Huck is one lucky kid as are you. 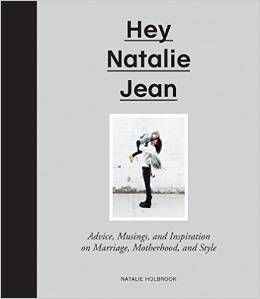 Natalie, I love your blog so very much.